Are you wondering where to get quality premium and dignified transfer services? Ellesmere Port Minibus is an excellent choice. Why? For more than a decade now, we have facilitated elegant travels through our Ellesmere Port, for both locals and visitors. Ellesmere Port Minibus is the prominent provider of luxury travels in the city. Our executive package comes with kingly treatment and VIP services. Be guaranteed that our drivers will take care of you from the start to the finish. 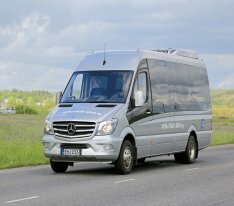 Here at Ellesmere Port Minibus, we have an extensive range of powerful and substantial 16 seater executive vehicles, including the Mercedes. The Mercedes is a premium vehicle, fitted with all the basic and super extra features. We are talking about hot and cold water, DVDs and armrest. Feel free to contact us if you have any special requests for Wi-Fi. All 16 seater executive vehicles features like have ESC stability control, sensors, remote central locking, DAB radio with Bluetooth, and a sliding side door on the left. Powered by very powerful engines, our 16 seater executives will facilitate a smooth journey,for you and your company, even on cold days. Everything about our range of Mercedes vehicles is deluxe, from the exterior to the interviews. From the outside, our 16 seater executives display prominence and utmost class, making it the befitting vehicle hire for an important event. The exterior is sleek, clean, sophisticated looking and well-polished, to offer you emperor-like transportation to wherever you are going in the city. Book any of our premium 16 seater executives today and take delight in the sophistication of leather interiors, carpeted ground, armrests, sufficient luggage space, curtains, high-tech equipment and top-notch heating and ventilation systems. There is also a princely entertainment system that you can enjoy as you journey all around Ellesmere Port. In case you are planning a trip for up to 16 people and you want premium services, contact us. We will get to you within minutes with the necessary quote. Please, do not be shy about our 16 seater executives. We promise that the rates are very competitive. Our 16 seater executive vehicles come with extremely comfortable leather seats, DVD and CD players and air condition. This vehicle is perfect for small groups. It is also very versatile as it can serve different purposes- airport trips, weddings, business meetings, conferences and so much more.